Sooo, I really wanted to record a video with Emi. But it's late, So I was tired and being a silly. :-P But I like it 'cause it's funny. I giggled really hard. Probably because it's late which makes it even more hilarious. OH, btw, I saw you on facebook!!! I was looking at this one group, and you are in it, and I was like, "OMG THAT'S IDZIE!" and I was soooo tempted to friend you, even though you'd have no idea who this random person friending you was, as my name isn't REALLY Stella and you have no clue what I look like, and my father would have a cow if I friended someone whom I've never met before. But it feels like I know you! Ah, we'll have to meet someday at one of these unschooling confrences. Then we can friend each other, lol. I hope this comment makes sense. Because like I said before, it's late. ha that made me lol several times!!! I'm posting this exactly an 51 minutes after Stella posted her comment! What are the odds? So ya, it's later. REALLY LATE! So late, it's early. its 2:30 A.M. Woo!!!! I'm not tired at all!!! Point is. i laughed at your video. uhhh....maybe i am tired. I can't think. O wait no that's normal. I think i'll just say bye before i keep ranting. so....ya...Bye!!! O wait! right i'm just a random person randomly commenting your blog. At 2:32 in the morning. Hope you appreciate that! Your laugh was cute. Seriously. Is your sister younger than you or older than you? The way I see it, it's possible either way..
Fun vlog. Nice to 'meet' Emi! 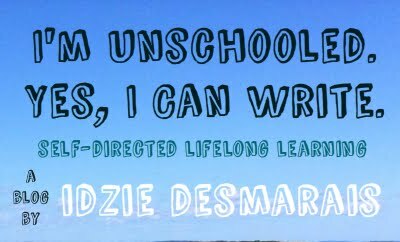 Unschooling writers, I need your help! Ooh, apparently it's Delurking Day!